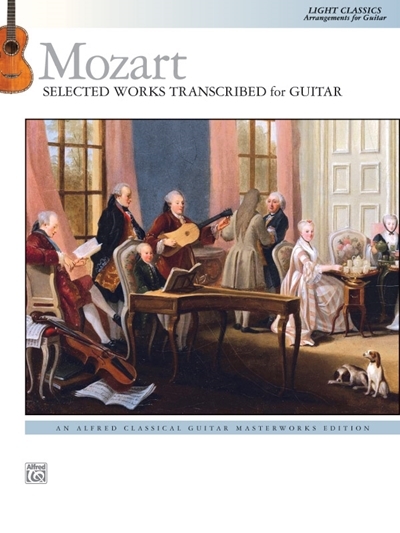 Intended for both working guitarists and those who play strictly for the enjoyment of great music, this collection of 14 famous pieces by Mozart will add something special to any party or gathering. Arrangements of masterpieces such as Eine kleine Nachtmusik, the "Minuet" from Don Giovanni, and even the piano favorite, "Rondo Alla Turca," make this a fun and edifying book to play through. A short essay on Mozart and his importance in music history is included, along with additional favorites, such as the theme from the first movement of the Sonata in C, K. 545 and the fourth movement from A Musical Joke, to provide you with a repertoire of crowd-pleasers for any event.